In some cases, oil has certain characteristics that you want to use, but water also has some useful properties. If you want to combine these you will need something that holds them together. This third party would be an emulsion. The mixture you end up with is reffered to as an emulsion. Oils are naturally hydrophobic, meaning they act as if they repell water. When oil molecules come into contact with water molecules, the molecules will not mix with each other. An emulsion is another substance that is both hydrophobic and hydrophilic. This gives it the capacity to cling to the oil molecule and also with the water molecule. The hydrophobic head will stick to the oil, the hydrophilic tail will stick to the water. This creates 2 different molecules, sticking together thanks to the emlusifier. 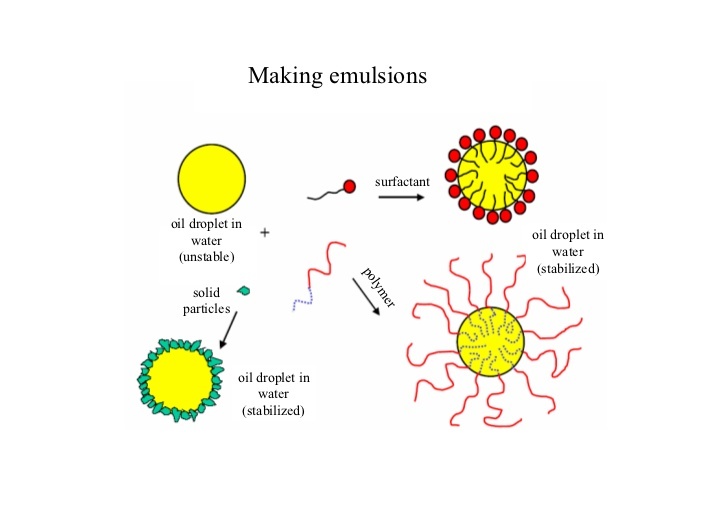 An emulsion can be usefull for several reasons. A cleaner is a good example. When you want to wash your dishes, you need to remove oil and other grim from the plates and pans. This means that the water has to be capable of mixing with the water, otherwise it will still be very difficult to remove. Soap turns water with a high surface tension into a solution with a very low surface tension, making it capable to interact will hydrophobic molecules. The emulsifier in the soap will make it possible for the water molecules to cling to the oil molecules, creating an emulsion of grease and water. Another popular formulation for an emulsion is a quick detailer. Many QD’s are emulsion of wax, oils and a water-like carrier. This basis makes it very easy to dilute the QD, and thus making it easier to create a concentrated version of the product, which is more economical and favorable for the customer. QD’s carry a mixture that is similar to paste wax, but thinner and with less wax-like ingredients. An emulsion has the property that it lowers the surface tension of the water and often turns it slightly cloudy. For cases in which it is (cosmetically) needed/wanted to have a perfectly clear liquid, it can be difficult to achieve this with enough emulsifier in the mixture. The lowered surface energy might also mean that the emulsion creates more wetting, which might not always be wanted. There are many examples of emulsions in our daily life.